BR Armament Technologies (B.R.A.T.) of Saluda, VA is currently producing AR uppers chambered for the 6BR and 6BRX cartridges. Unlike some other previous AR conversions for the 6BR cartridge, the BR15 uppers produced by B.R.A.T. do not merely use a .223-sized bolt opened up to fit the .308-sized rim of the 6BR case. Instead B.R.A.T. employs a different bolt design that is bigger, and significantly stronger in the lug area. 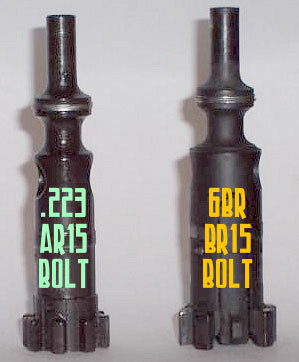 Shown below is a .223-sized bolt (left) and a BR15 bolt from B.R.A.T. on the right. The B.R.A.T. BR15 upper receiver has been specifically designed to use the 6BR family of cartridges. It has a larger bolt, modified bolt carrier, modified upper receiver, larger barrel extension, and most importantly an all-new magazine designed specifically to handle the BR class of cartridges. All other parts are standard AR15. The folks at B.R.A.T. have developed their own magazines. These are 5-round center-feed dual column magazines that work with the 6BR, 6BR-derived cases (like 22 BR), and the 6BRX. Since the round feeds from the center, the mags can also be used for single-feeding. B.R.A.T. is operated by two long-time competition shooters, both High Power High Masters, both Distinguished Riflemen, and both former captains of the U.S. Air Force Shooting team. President Eric Bellows has placed in the top 10 in the NTI and Presidents matches many times. Eric is former VT State Champion. Bill Walter, Chief Development Engineer, is former FL State Champion, Eliah Root team member, and is current military Palma Match record holder. NOTE: We have not used or tested a B.R.A.T. upper or magazine. We are just passing on this information at the request of readers. You will find more product specs, and comparitive ballistics, on the B.R.A.T. website. Currently BRAT-15 uppers retail for $1390 with a Douglas barrel or $1550 with a Krieger barrel, chambered either as 6BR or as 6BRX. For another $100, B.R.A.T. offers uppers chambered in 22 BR, 6.5 BR, or 7mm BR. For more info, email 6BRrifles [at] bratrifles.com, or call (804) 824-7248. Share the post "B.R.A.T. Offers 6BR and 6BRX Uppers for AR High Power Shooters"
Cool idea – 6BR is a great cartridge and even more fun out of an AR-15! It would be ideal if they could get beefed up rigid upper receivers going with that set up. Is this the same one that John Blair was involved with? Can one be purchased , and if so what would be cost . working on a hunting cartridge for Iowa whitetail using a shortened 308 case to 1.800 and a .429 bullet in a ar15 but my struggle is bolt and extension . I do understand and take full responsibility of my actions, I was going mill out a standard bolt but came across your 6BR letter . And your bolt looked like a better alternative .